So why did I love this book so much? First of all, the concepts are amazing. They are original and unlike anything I have ever read before. Each of these stories was so different from the others. If this book had ten more stories I still wouldn’t be bored by the end. The stories are about bigger issues in society and human beings. 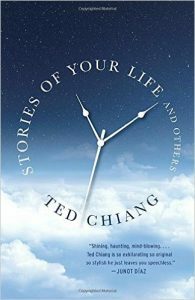 Ted Chiang manages to put so much emotion into them. In ‘Liking What You See: A Documentary’ there is a device that leaves people unable to see beauty in faces and feel attracted to it. This opens a discussion about lookism, the media and how it influences people but also a person’s freedom and whether these issues should be handled through education. I also loved the religious aspects of the book. Which were heavier in ‘The Tower of Babylon’, ‘Hell is the Absence of God’ and even ‘Seventy-Two Letters’ especially. It added something to the stories that I haven’t read before. I did have one problem with this book. Some of the science was a bit too complicated for me. Certain stories were harder to read than others. It felt as if there was too much information dumped on me at once. I even skipped one because of this. But for most of the stories it was worth the effort. Days after reading this book I still find myself thinking about the stories. They were really unforgettable. I tell everybody about this book, even people who don’t like reading. So I would recommend this book to everyone.